PRO referee Sorin Stoica returned to Major League Soccer action in week 9, fighting back to fitness after a lengthy injury absence. After grabbing some game time in the NASL and USL, Stoica marked his comeback at Yankee Stadium for New York City versus Vancouver Whitecaps, and followed that up with another assignment in week 11 by taking charge of a midweek match-up between Philadelphia Union and Los Angeles Galaxy. Stoica was quick to praise PRO – and one man in particular – for their support throughout his rehabilitation. “My problem started with a small stretch of a hamstring but, during the fitness test in January, I injured my hip,” the center official said. “After two weeks of total inactivity, we found that I actually had Hamstring Tendinopathy which would need further treatment. I’ve recovered now though. I’m feeling really good and ready for more assignments. “A big thanks has to go to PRO management, who helped me to get fit and assigned me to some USL and NASL games, when I was ready to find my ‘game shape!’. 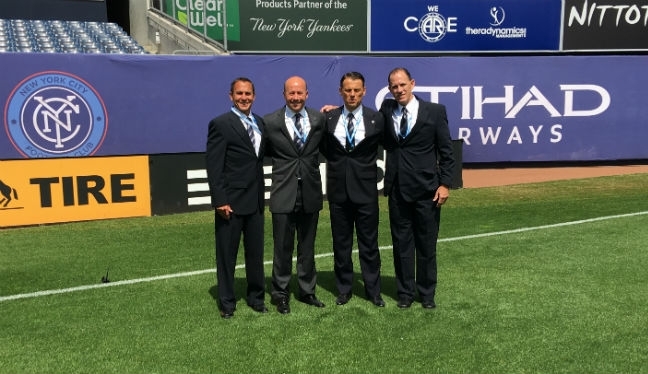 The Romanian official, who recently told proreferees.com about his journey from a police officer to MLS referee, was delighted to be back among the action once more. His targets for now are simple – rediscover the form of last year which saw him earn 16 center assignments and fourth official duties for the MLS All-Star game, and maintain that throughout the rest of the 2016 season. “I was happy and excited from when I received the New York assignment. It wasn’t easy to sit and just watch from the side for almost two months, with my colleagues out there doing a good job every week, and me not being there. “The game itself was fantastic. The speed and the level of soccer was high. And, guess what? A goal in the 36th second, with the ball bouncing on the goal line! “I had an excellent crew to work with [AR1: Sean Hurd, AR2: Kermit Quisenberry, 4TH: Alex Chilowicz], and I want to thank them very much for their professionalism. I think we did a very good job in helping the match flow and handled an exciting and entertaining game to watch. “Of course, as always, there were some things I would like to have done in a different way, but that is part of on ongoing learning process in the modern game of soccer. Focus and concentration are big factors in our job and we cannot lose that from the first to the last whistle.